With so many TVs, cable boxes, media streamers, DVD players, and other electronic components out there, your home can become covered in a web of wires. Thankfully, most audio/video devices converge on a single standard cable to move audio and video: HDMI. Our newest version 2.0b HDMI male to female extension cable 25 ft. extends the reach of your existing HDMI cables, allowing you to connect devices which are too far away. This HDMI port extender/port saver helps put less stress on the internal ports of your devices. It supports advanced HDMI features such as: 4K resolution, ultra HD 2160p, bandwidth up to 18Gbps, 3D HD, ethernet and audio return. Backwards compatible with all classifications of older High Speed HDMI Cable versions 2.0 or 1.4. The premium construction of our HDMI extension cable - 25 feet features corrosion-resistant gold-plated connectors, full metal jacket, 26 AWG, triple shielding, and solid copper conductors. The durable, nylon braided sleeve flattens or flexes and contours to preferred form. They support full 60Hz at 4K resolution, 2160p, 48 bit/PX color depth and bandwidth speed of up to 18GBps to meet the latest HDMI standards. Ultra Clarity Cables are backed by a limited 1-year warranty should any issue arise. For questions or concerns please contact our friendly, USA-based customer support team. 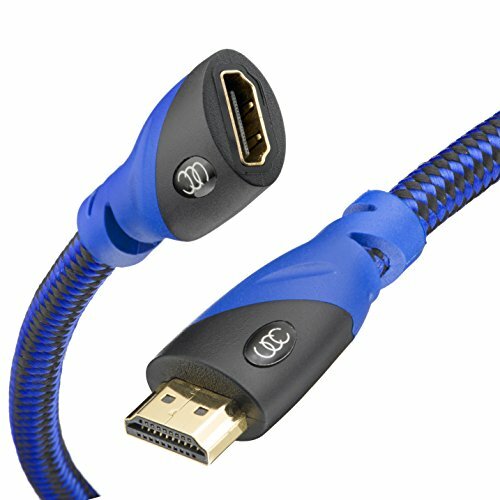 1 HDMI extension cable, 25' with blue/black nylon braided sleeve and gold-plated male/female connectors. Please Note: To ensure 4Kx2K @60Hz, the total length of the HDMI cables should not exceed 50'. Extending a cable that is 28 AWG longer than 50 ft would require a signal booster or repeater. QUALITY CONTROL - Each HDMI extender cable 25 FT goes through rigorous testing to ensure that it consistently maintains a steady signal connection with optimum streaming, rich colors, crisp imaging, and no interference or flickering. HDMI LATEST STANDARD - Our High-speed HDMI extension cable certified version 2.0b is the latest HDMI standard and is backwards compatible with all previous versions, providing maximum quality performance for your gaming or home theater setup that support the latest and most advanced HDMI features. PERFORMANCE - This HDCP 2.2 Compliant HDMI male to female extension cable is 4K resolution ready and supports full 60Hz, 2160p, 48 bit/PX color depth and bandwidth speed of up to 18GBps to meet the latest HDMI standards. Compatible with: HDTV, Blu-Ray players, Apple TV, Fire Stick, Roku, PS4, Xbox One, computers, cable boxes, and devices with standard HDMI ports. CONFIGURATION - The HDMI extender cable - 25 FEET features corrosion-resistant gold-plated connectors, full metal jacket, 26 AWG, triple shielding, and solid copper conductors. The durable, nylon braided sleeve flattens or flexes and contours to preferred form. WARRANTY - Ultra Clarity Cables are backed by a limited 1-year warranty should any issue arise. For questions or concerns please contact our friendly, USA-based customer support team. If you have any questions about this product by Ultra Clarity Cables, contact us by completing and submitting the form below. If you are looking for a specif part number, please include it with your message.